OK. For the recent uninformed visitor that goes by “Barbara”, due to “her” inability to do “her” own homework and due to “her” obvious lack of the ability to think for “herself” (could be attributed to “her” self-proclaimed age of 62), the following are the posts, articles and items I have collected since last July. I have them classified as COLB and COLB Forgery. My personal posts are located here and here. At one point in time, I was under the understanding that the issue of Barack’s citizenship was a non-issue and the ensuing witch hunt that was prevalent from last January was an embarrassment. It wasn’t until the weekend of the Move America Forward major and huge on-line Troopathon that my original opinion of this issue began to fade. During the time that I thought the issue was an atrocity perpetrated from the nuts on the right, I did not write on the subject but visited other sites and left comments trying to persuade others to drop it and fight on issues that mattered. I never brought up the issue on my Blog Talk Radio shows either. That all changed on 04 JUL 08 thanks to my friend Pamela Geller of Atlas Shrugs whom I disagreed with on this issue of the COLB v Birth Certificate. Since that time, using my investigative skills and my Spook training and verbiage analysis training and applications learned, developed and expounded upon for decades, I began to see an underlying current in this issue as it began to unfold. Most missed it. Some still miss it. I bring up that which most have missed or perhaps disregarded was the fact that Barack Hussein Obama can place this whole issue to bed very easily and quickly yet has not done so. The question is why he hasn’t to this point. It could be because of the audacity of people to dare question him. We have all seen the way he reacted (never responded – there is a difference) to anyone questioning him on any issue. It could be his narcissistic and arrogance that has caused him to not place this issue to bed and that has resulted in his inability to appear weak and cornered. He, being the typical American liberal democrat, cannot ever be seen as weak or vulnerable or to take personal responsibility for a bad decision and that bad decision was to drop this issue back in April of 2008. He could have very well ended all discussions of his natural-born status when John McCain’s was ended but he did not. Perhaps because he could not and cannot still. In April of 2008, Senator McCain’s “natural born” citizen status was settled by Senate Resolution 511. I thought it peculiar that Patrick Leahy would make the comment that the term “natural born citizen” was not defined in the Constitution when it clearly is defined. One doesn’t need to be a rocket scientist to detect the Constitutional definition when the definition is clearly stated in the Constitution. There is other verbiage in the Resolution that is equally suspect. This statement was added to the Resolution by none other than Barack Hussein Obama. Why? In the process of my self-admonitions of following for a well crafted scam, I ran across this post recently after Pamela Geller rocked my world back in July. Indeed. My learning and my cravings for knowledge will never end on this subject. In the linked post, I learned several other items of interest and I do believe that honest people will also see the light, as it were. Naturally, the apologists that can never admit to being in error will claim high and mighty blissful ignorance. That segment linked above has since been scrubbed from Obama’s web site and by his own admissions, he is of Kenyan birth. Perhaps that is why the Kenyan Ambassador to the United States has stated in a recent interview that Obama’s birthplace in Kenya is well known and why Kenya has proclaimed a National Holiday in honor of one of their own ascending to the Presidency of the United States. I did a special show on the Kenyan connection last week where we aired the interview with the Ambassador. If Obama was not born in Kenya, why then did his Kenyan citizenship expire in 1982 and how did he come to have dual citizenship when Kenya does not recognize or allow dual citizenship other than British? A shortened portion of that interview can be heard here and the entire interview can be heard here, complete with mundane chit-chat. The first 10 minutes is fairly boring actually. By the way, the photo to the left is not a viable birth certificate but it is just as valid as the COLB posted around the internet. I find it comical in a sad sense that the COLB that was proven to be a forgery is still being presented as authentic when the original postings as MoveOn, KOS and Obama’s web sites have all been removed. There is a pathology to that I am sure. Barack Obama and his campaign have spent nearly $800K to NOT reveal the authentic vault birth certificate that every American is issued upon birth. The average cost of obtaining a certified copy of the obtainable birth certificate is $10. Why not spend the $10 and put this issue to rest. If he is in fact a natural born citizen, so be it and we can get along fighting his Marxist nonsense and his pathetically vague policies. The forged COLB being passed off as a birth certificate (a COLB is not a BC) process is detailed here. Thank God for document forensic science. It is said that there is a vault copy in Hawaii dated 1961 which is type writer written and sealed from public view and is said to have been released on November 15th. That never happened. The lad to the right is the forgery dude and he has been cornered and caught. This happened on 06 JUL 08 and the Obama Media is oddly silent. 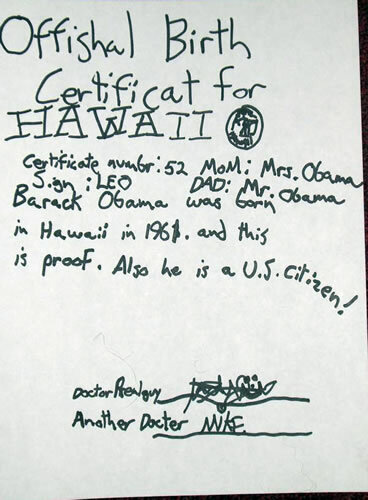 He is or was the Obama Spokesman that stated that the forgery was real and was the official birth certificate. 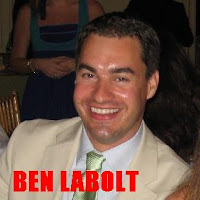 Oddly enough, or not, Labolt didn’t know that a COLB wasn’t a birth certificate as most of the libtards don’t know as well. Curious, ain’t it? This is merely one more example in a very long and historical list of examples of how the Leftinistra repeat a lie for long periods of time hoping and knowing that the easily led and easily duped with believe a lie when it is heard over and over, over a long period of time. Why would the natural born clause be an obstacle? And, in whose path is the obstacle in the way of? Interesting this is indeed. The answer is in further study and discovery, using the legalese of the Friends of Barack, mainly the law firm of whose employ the author of this piece is beholden to. When did Barack decide to run as President? Wasn’t it in 2006, officially? What are the odds that Leftinistra law firms and Leftinistra Chicago lawyers of that law firm, which had/have long historical relationships with Czarbie, suddenly be wanting to “deal with” that damned pesky “natural-born clause”? Hmm? Be prepared, ladies and gentlemen. A fully socialized and “communal” (globalized) America is on the horizon if we do not rise up to the salvation od our Freedoms so richly threatened by the globalization socialists that dwell among us. And morons say that the List of 45 is crazy. HA! I find all of this ironic because GWB’s critics criticized him for his “Globalization” outreach yet these same critics are themselves Globalists. I guess once more that Globalization is only good when the socialists do it. Go ahead Barack. Make my day. Show your VAULT birth certificate and stop being a coward, cowering behind your Goon Squads and that forged Certificate of Live Birth fraud and scam. If you have an honest bone in your body, you would end this once and for all. Oh. Wait.